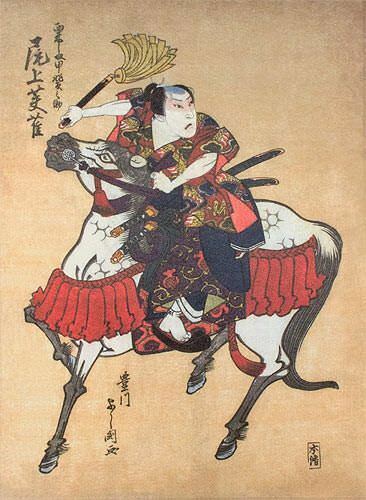 Artwork Panel: 28.2cm x 38.3cm ≈ 11" x 15"
Silk/Brocade: 37.3cm x 101.1cm ≈ 14¾" x 39¾"
This depicts Samurai Awashima Kainosuke on horseback. This is actually the actor Onoe Fujaku III playing this Samurai in a live production. Original artist: Toyokawa Yoshikuni / 豊川芳国 (1813 - 1832). This artist was also known as Jukodo Yoshikuni / 寿好堂よし国 and Jukotei / 寿好亭. Original woodblock was created in Japan, around 1825.